Sewer pipes do not break often, but when they do, it is a nightmare. Luckily, bad sewer pipes will give you clear signs that they need an inspection. The examination could reveal that all you need is a pipe cleanup—there is a camera to use for that—but other times, you might need a repair. However, before you think the idea of a repair sounds even worse than the sewer pipe problem, you should know about NuFlow’s trenchless sewer line replacement solution. Normally, the way to fix a damaged pipe is by digging a hole. It makes sense too. After all, the pipe is underground. However, there are some concerns to consider before digging a trench. First, digging a trench can take days to complete, and requires heavy machinery. This means that your property will not have sewage service for however long the trenching process takes. Second, there are important environmental factors to consider. To put it bluntly, it is a sewer pipe. Nothing you want to be close to flows through it. And if the pipe is damaged, that means that whatever is supposed to flow through the pipe more than likely has leaked around the pipe. So when the trench crew digs, all that waste has to come out the surface. The reason why people are choosing trenchless sewer line replacement is that it is faster, cleaner, and it leaves you with a brand new sewer pipe with better flow and longer life expectancy than the one you had before. First, we guide a high definition camera through the sewer line. The goal is to make a map of the pipe, so we know what areas need more attention. We could find blockages, fractures or root intrusions. Once we know what is inside the pipe we choose the right cleaning tool. Most times, the best solution is to use a spider drill to clear the sewer pipe. Once the pipe is cleared, we are ready for the last step. Finally, we prepare an epoxy solution that we pull through your existing sewer line. The epoxy line will be inflated so it takes the shape of the sewer line. After a few hours, the epoxy will dry and harden, leaving a perfectly clean and functional sewer pipe, better than the one you had before. And we do all of this without having to dig a single trench. 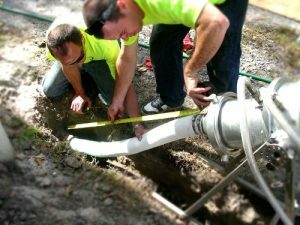 NuFlow’s trenchless sewer line replacement service saves you time, money and downtime. Before we begin working, we will develop a plan of action. As a customer, you will know what we intend to do and, more importantly, why we think it is the best way to go. The diagnosis process is accurate and we want you to be a part of it. It could be that all you need is a sewer cleaning service, or you might need a full sewer line replacement. Whatever the case, we will make sure you have all the information you need, and that the final result works better than before. The greatest value you get from our trenchless service, is that the process is clean, and it takes hours, not days. And if that was not enough, the new sewer line is stronger, cleaner and gives better flow than it originally was. Get in touch with NuFlow today. We will show you why a trenchless sewer line replacement service is the best option.